Hydrogen is deceptively simple. It has only a single electron per atom, but it powers the sun and forms the majority of the observed universe. As such, it is naturally exposed to the entire range of pressures and temperatures available in the whole cosmos. New theoretical work at the Geophysical Laboratory provides surprising insight into the behavior of this material under extreme pressures. At high pressures, hydrogen is predicted to transform to a metal, which means it conducts electricity. One of the goals of high pressure research, going back to the 1930s, has been to achieve a metallic state in hydrogen. There have been recent claims of hydrogen becoming metallic at room temperature, but they are controversial. Experiments performed recently at the Geophysical Laboratory have clarified these findings and shown that the material takes on entirely new forms on the way to becoming a metal. New theoretical work from the Geophysical Laboratory extends the experimental results and makes significant additions to our understanding of this vital element’s high-pressure behavior. 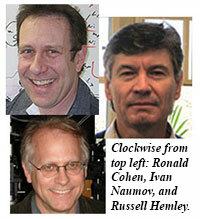 Their work is published in two papers by Proceedings of the National Academy of Sciences and Physical Review B. 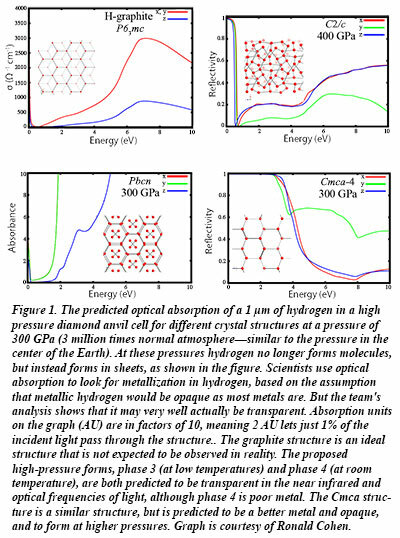 The theoretical calculations by Ronald Cohen, Ivan Naumov, and CDAC Director Russell Hemley show that under high pressure, hydrogen takes on a series of structures of layered honeycomb-like lattices, similar to graphite, that have distinct optical characteristics. The layers, which are like the carbon sheets that form graphene, make a very poor, transparent metal. This result helps to explain the experimental results reported during the past year using synchrotron infrared spectroscopy. The difficulty of detection means that the line between metal and non-metal in hydrogen is likely blurrier than they had previously thought. Their new results will help experimental scientists test for metallic hydrogen using advanced techniques involving the reflectivity of light [Naumov et al., Phys. Rev. B 88, 045125 (2013); Cohen et al., Proc. Nat. Acad. Sci. doi:10.1073/pnas.1312256110 (2013)].